My long lost friend Hans Fex generously lent me this twinkly music box. Use a special hole puncher to punch out individual notes on a strip of paper, then run the paper through the machine to hear the results. The templates come printed with a grid so you can hit each note dead center. 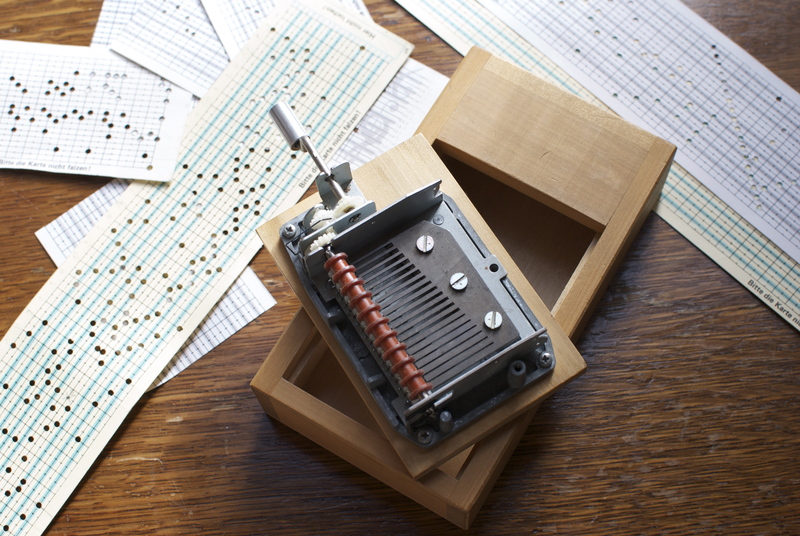 This composition for punch hole music box, Melancholy and Rust, is more than just a lovely tune. Its melody and accompaniment are designed so that the piece can be run through the machine right side up, upside down, and backward-upside-down. For you music geeks out there, that’s a shout out to the principles of 12-tone composition, here using prime, inversion, and retrograde inversion techniques. Only instead of flipping staves upside down and backward, we are flipping a piece of paper. 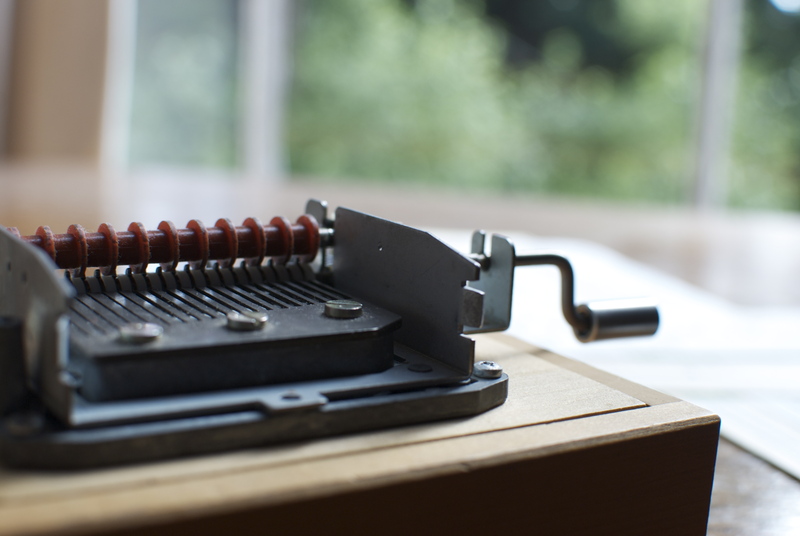 This particular music box has a diatonic 1 octave+6th range (C to A), so if you use the full range of notes, A minor will invert to C major, and vice versa. Oh, toss all that theoretical nonsense aside! Begone academia! The real delights here are the twinkly tone, the creaking and rattling of the mechanism, the astonishing power of the miniature resonating box. And what about the delight of (mis)punching holes and surprising yourself with the results? True, it tries my patience to meticulously scotch tape closed any mistaken punches, but it’s usually best to just integrate them the final product. Best of all, musicians and non-musicians alike can punch-compose, perhaps using musical knowledge, visual patterns, random bites, blind inspiration, or other aesthetics. 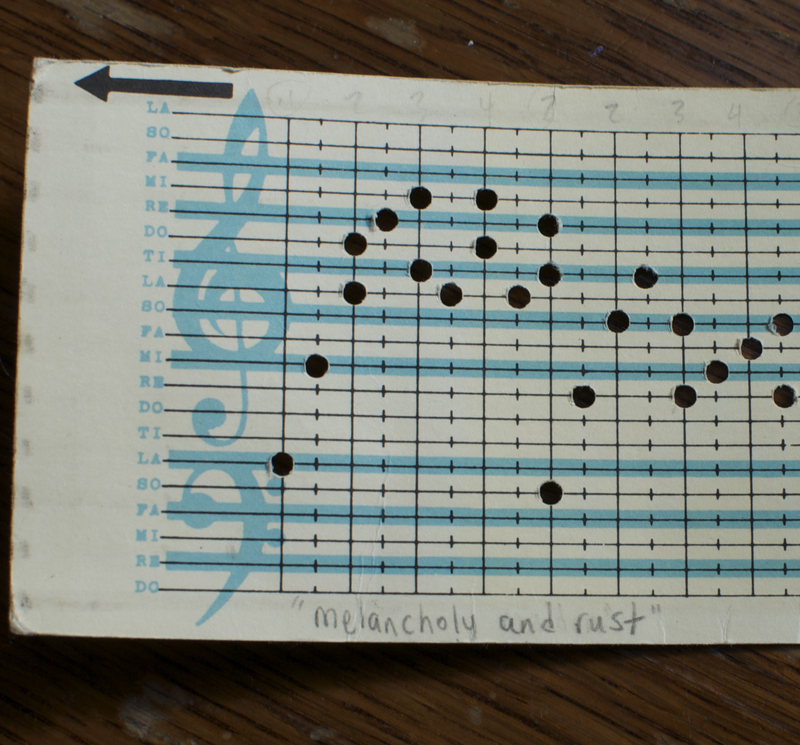 Now, Melancholy and Rust, played in three different orientations. Friday, July 9, 2010. 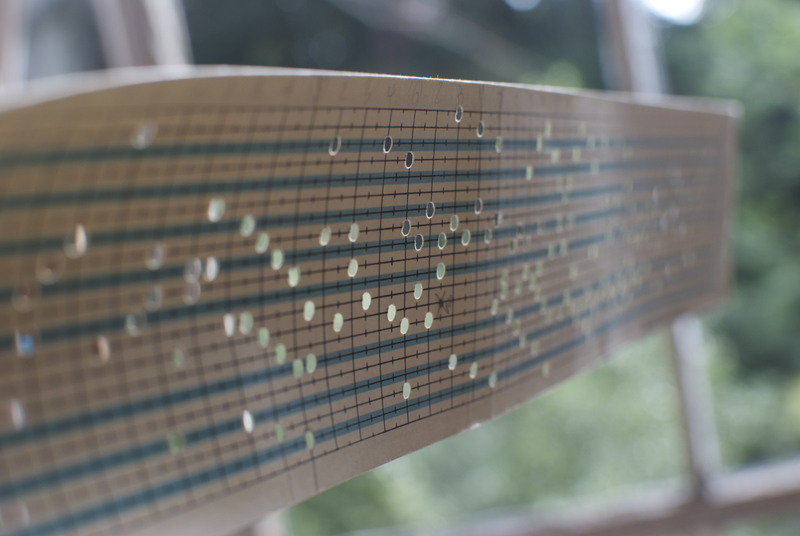 Tags: diy music box, music, music box, traditional music. music, traditional music, Uncategorized. 8 comments.